Flour is grains that have been dried and ground into powder. It is usually made of wheat. Flour is used to make many foods. ↑ "What is self-rising flour?". Baking Bites. 2 August 2007. http://bakingbites.com/2007/08/what-is-self-rising-flour/. ↑ Priya Johnson (29 August 2012). "Self-rising Flour Vs. All-purpose Flour". Buzzle. 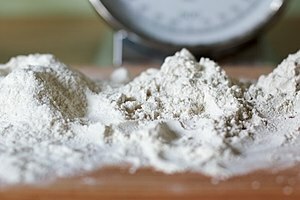 http://www.buzzle.com/articles/self-rising-flour-vs-all-purpose-flour.html. This page was last changed on 3 October 2014, at 16:21.